Passion fruit, first cultivated in the tropics of South America, has provided both its culinary and medicinal benefits to people all over the world. Passion fruit – originally from South America – is not just a culinary and aromatic delight, but it also contains medicinal compounds. This tropical fruit is now cultivated across the globe for its many benefits. Relieving stress and anxiety. Passion fruit provides a relaxant effect, which helps soothe the nerves, reducing anxiety and controlling panic attacks. Lowering blood pressure. Due in part to its anxiolytic properties, passion fruit also provides hypotensive effects, which help maintain cardiovascular health. Additionally, passion fruit can be helpful for improving digestion and bowel movements, as well as for supporting bones health. 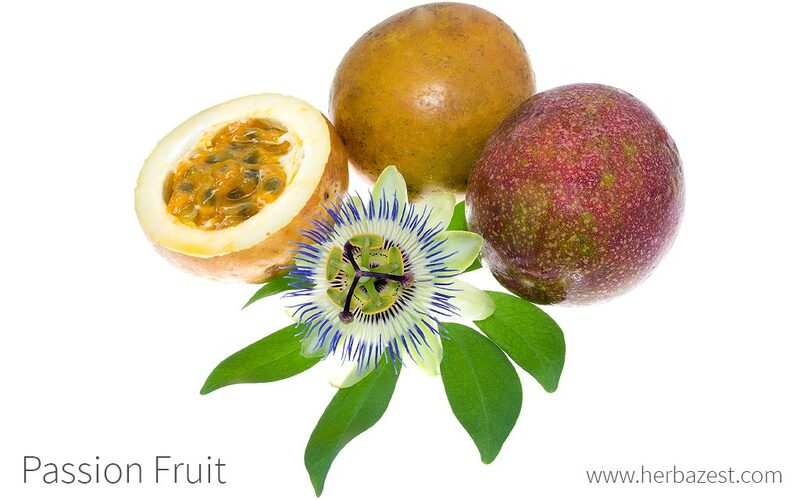 The aerial parts of passion fruit have shown relaxant effects at low doses, and sedative actions at higher doses. This is due mainly to the abundance of flavonoids; however, it is thought that other compounds may also be responsible for these nerve-soothing benefits. The combined action of the phenolic compounds, ascorbic acid, carotenoids, and flavonoids contained in the pulp of yellow passion fruit have proven effective in reducing systolic blood pressure. YELLOW PASSION FRUIT CONTAINS APPROXIMATELY 165 VOLATILE COMPOUNDS. Other herbs that promote relaxation and reduce anxiety are jasmine, lemon balm, and valerian, whereas lucuma and saffron help reduce blood pressure and support cardiovascular health. When consumed in excess, passion fruit can also cause somnolence, and the latex present in the rind and other parts of the plant may trigger allergic reactions, including itching, rash, watery eyes and nose, and asthma. The pulp of passion fruit contains cyanogenic glycosides, which are natural plant toxins present in several species. Unripe passion fruits contain the highest concentration of cyanide glycosides, losing most of their toxicity as they mature. When ingested, cyanogenic glycosides interact with digestive enzymes, releasing hydrogen cyanide, which is poisonous in significant amounts. Early symptoms of cyanide poisoning include lightheadedness, giddiness, rapid breathing, nausea, vomiting (emesis), feeling of neck constriction and suffocation, confusion, restlessness, and anxiety. When buying passion fruits, it is safer to pick the mature, wrinkled ones, which also release a strong, citrus odor and have a sweeter flavor. People taking antihypertensive drugs, as well as those consuming sedatives and anxiolitics, must be aware that consuming passion fruit in excess, or in remedial forms can potentiate the effects those medications. Additionally, people taking medications to prevent transplant rejection, such as tacrolimus or cyclosporine, are advised not to consume passion fruit. Passion fruit is also remarkable for its high nutritional value. The fresh fruit contains a significant quantity of vitamin A precursors - carotenoids - in addition to vitamin C (ascorbic acid), dietary fiber,and iron. Passion fruit is also rich in potassium and makes a good alternative source of the antioxidant lycopene. Passion fruit is typically consumed as a culinary delight. However, in order to maximize its health benefits, this exotic fruit is also consumed in medicinal preparations. Raw. To consume passion fruit raw, the rind is sliced and opened, revealing the seeds and pulp. The pulp is then scooped out and swallowed without the seeds being chewed. The pulp of purple varieties of passion fruit is less acidic and about 35% juicier than yellow passion fruit. Juice. Passion fruit juice is a refreshing and mess-free way to enjoy the fruit and reap its relaxant and hypotensive benefits. Infusion. Enjoyed for both its taste and relaxation properties, passion fruit infusions are typically brewed from teabags orloose-leaf preparations. Powder. The benefits of the whole dried and processed fruit can also be found as a powder. Capsules. A concentrated form of passion fruit, capsules are useful for treating anxiety disorders and lowering blood pressure. Raw passion fruit is easy to find in most grocery stores or local markets around the world. The most common presentation of raw passion fruit is as a whole, shelled fruit, though it is also available tinned. In the U.S., there are two popular varieties: one purple and one yellow. Regardless of hue, both varieties have a similar sweet and tangy taste. On the other hand, passion fruit teabags are readily available for purchase through online retailers. Passion fruit capsules are mainly found in specialized health stores and online retailers. Passion fruit is a tropical vine, and requires a habitat similar to its native one to thrive. In warm areas, it can be successfully grown at home. Passion fruit vines are usually grown from seeds, but they can also be propagated from cuttings, which require hormone treatment and 90 days of rooting before being transplanted. Passion fruit plants can thrive in most types of soils, as long as they are well-drained, with a pH range of 6.5-7.5. If the soil is too acid, lime must be applied. Passion fruit plants full sun exposure. However, when temperatures are too high, partial shade is also required. For commercial purposes, the vines are trained to strongly-supported wire trellises at least seven feet (2.13 m) high. However, for home gardeners it is much easier letting the plant to climb a tall tree, which will also make it less prone to pests and diseases. Regular watering will keep a vine flowering and fruiting almost continuously, and it is especially important when fruits are approaching maturity. Both water and nitrogen fertilization balance is key to developing high quality, flavorful fruits. The passion fruit vine, especially the yellow variety, is fast-growing and will begin to bear fruits within one to three years. In tropical areas, like Hawaii, passion fruits mature from June through January, with heaviest crops from July to August, as well as in October and November. Passion fruit is a large vine with green leaves, 3 - 8 inches (8 - 20 cm) long, and fragrant white and purple flowers. It is prized because of its fruit, which is round and covered in a waxy hard shell and a sweet, orange-yellow pulp. Passion fruit is a member of the Passifloraceae family, which contains 530 species spread across 27 genera. Members of this family includes trees, shrubs, and climbing plants, all of which flower. Most species of the Passifloraceae family grow in tropical regions. There are two naturally-occurring varieties of passion fruit (Passiflora edulis), yellow and purple. Prominent yellow cultivars include 'Yee Selection', 'Noel's Special', 'Hawaiiana', and 'Mirim', among others. Some of the most widely-cultivated purple cultivars are 'Bali Hai', 'Ouropretano', 'Common Purple', and 'Brasilera rosada'. Although passion fruit has most likely been grown for much longer, the earliest recordings of it are from the 16th century, when it was made known to the Western world via Spanish conquerors in Brazil. From there, it was taken to Europe before being spread throughout the rest of the globe and valued for both its culinary and medicinal properties. In 1880, it was introduced to Hawaii, where it adapted easily and eventually began growing wild. Brazil currently produces the most passion fruit in the world. However, it is grown in most places across the tropical belt, including other South American countries, Australia, and parts of Asia and Africa. It is estimated that the total worldwide production of passion fruit each year is 852,000 tons. Brazil accounts for 90% of production, and the principle market is Europe, which imports more than 90% of the juice produced. Fodder. The fruit's rind can be chopped for use as cattle fodder or be converted into silage. Cosmetics. Passion fruit essential oil is also sometimes used in perfumes, soaps, shampoos, and other personal care products.